Of course, there are different variations of vegetarianism within the spectrum and every form of vegetarianism is equally valid. I myself am an ovo-lacto vegetarian and recently, I have begun to cut out dairy products such as cheese and milk from my diet as well. On certain days, I actually stick to a Buddhist vegetarian diet, but most of the time, I still do take onion and garlic. Now that I’ve given you a brief overview about vegetarianism and where I fall in, we can move on to our review of Mad for Garlic. Originating from Korea, the restaurant chain offers a cuisine that can be best described as innovative with its garlic-inspired Italian menu. My friend and I have on several occasions seen snaking queues outside Mad for Garlic at The Foundry and in true Singaporean style, we were intrigued by what they had to offer. It is easy to miss Mad for Garlic as it is situated in a corner, right behind Starbucks in Suntec City Convention Centre. The restaurant is dimly lit, with a dark interior decorated to create a cosy and semi-baroque ambience. The restaurant is spacious and can easily seat up to 50 people and still allow for audible conversation over food. Since we arrived at 3pm, the restaurant is relatively empty and we were served very quickly by the friendly staff. A quick glance at the menu reveals that every dish, right down to the dessert, has garlic as its main ingredient. Along with their famous Garlic Snow Pizza and the variety of pasta, there are a few ova-lacto vegetarian friendly dishes on the menu such as the Garlic Fried Rice, Aglio Olio, and Vegetarian Pizza. After much perusing, my friend decided on the Clam and Seafood Pasta, while I ordered a Calzone after checking with the staff that the Garlic Cream Calzone did not have any meat fillings. We also ordered a side of Garlic Baguette as a starter to our meal since it is an ubiquitous dish to have in a garlic-themed restaurant. The Garlic Baguette (half) was indeed a good start to our lunch. We were certainly impressed by the size of the serving for a half-baguette. The bread crust was toasty and the aroma of the baguette was not overpowered by the herb and garlic spread on the fluffy bread. The herb and butter spread was aromatic, sweet and savoury at the same time. The spread was also light and does not leave an overpowering taste of garlic or a greasy aftertaste in the mouth. We were very taken with the Garlic Baguette and wished we had ordered a full baguette instead. Just as we worked an appetite with the Garlic Baguette, our mains were served. 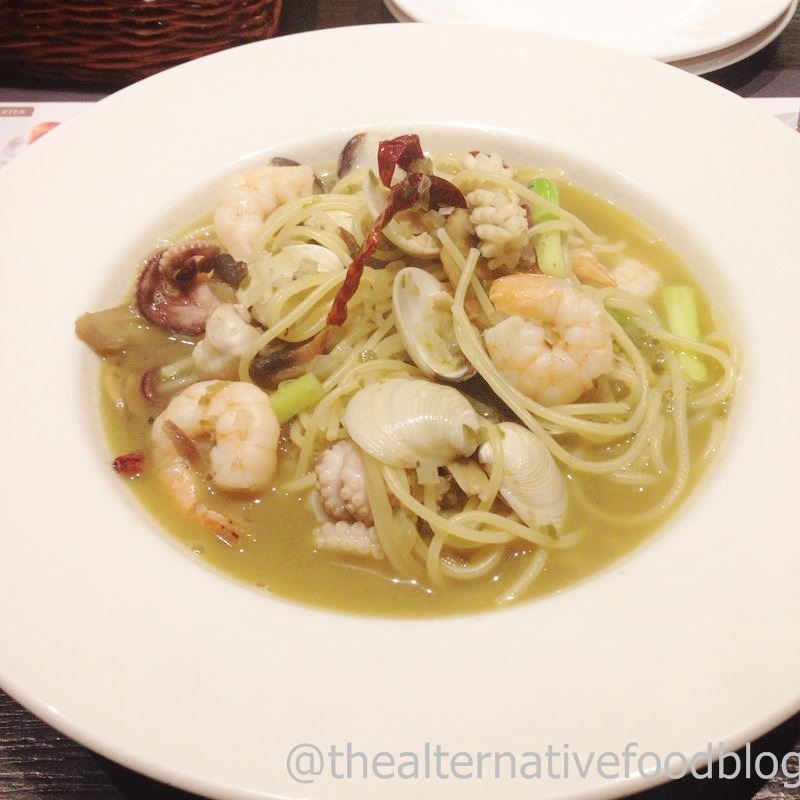 The Clams and Seafood Pasta (SGD 23.50) was a surprise as my friend was not expecting it to be a soup-based dish. The pasta, done al-dente, was served in a stock that tasted of miso and garlic, along with a generous serving of fresh seafood. The clams and squid were fresh and not overcooked, and the freshness of the dish was accentuated by the miso stock that was not too salty nor was it overpowered by the garlic. It was a refreshing change to the tomato or cream based pasta we are so familiar with in Singapore. 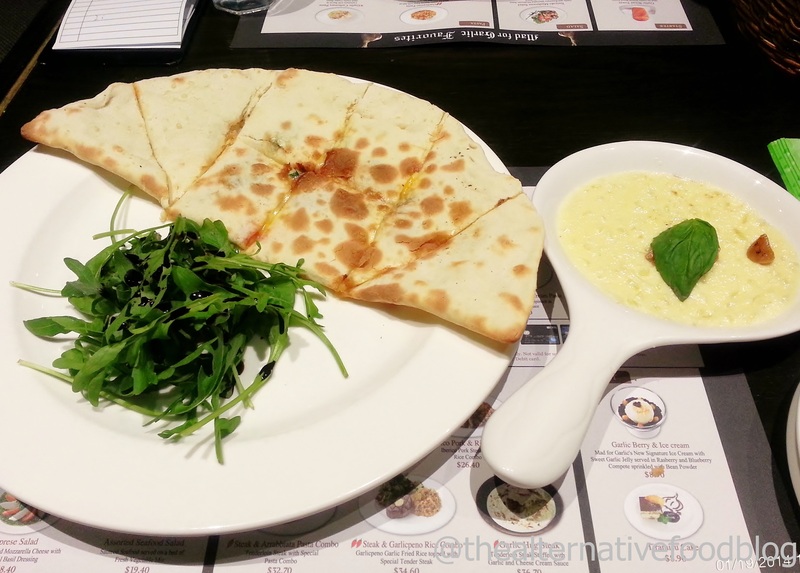 My Garlic Cream Calzone (SGD 20.90) was also a surprise for me. Instead of a regular puff-like calzone, this calzone resembles a folded pizza. In fact, it is made by folding a large cheese-and-herb filled pizza into a half-moon shape. The Garlic Cream Calzone was so huge, the serving staff had to cut it into smaller pieces for me. To ensure that the food is fresh and prepared according to the strictest hygienic standards, the serving staff sliced the calzone in front of me, to ensure that the food has not been tampered with from the time it left the oven to when it was served to me. The calzone is served with a dish of sweet roasted garlic cream and a small serving of rocket leaves tossed in balsamic vinaigrette. The calzone crust is thin, crispy and fragrant, much like the thin crusted pizzas we are accustomed to. The filling – made with a tomato base, herbs, and four types of cheeses – was not overpowering and added a chewy and creamy texture to the crispy calzone crust. The calzone tasted even better when paired with the sweet garlic cream. The cream is sweet and has the nutty flavour of roasted garlic, without the pungent aftertaste that comes with raw garlic. I could detect some diced onions in the cream and they definitely add to the sweetness of the crem, and balanced the savoury of the cheeses in the calzone. The smallest serving of rocket leaves also provided a balance to the dish. 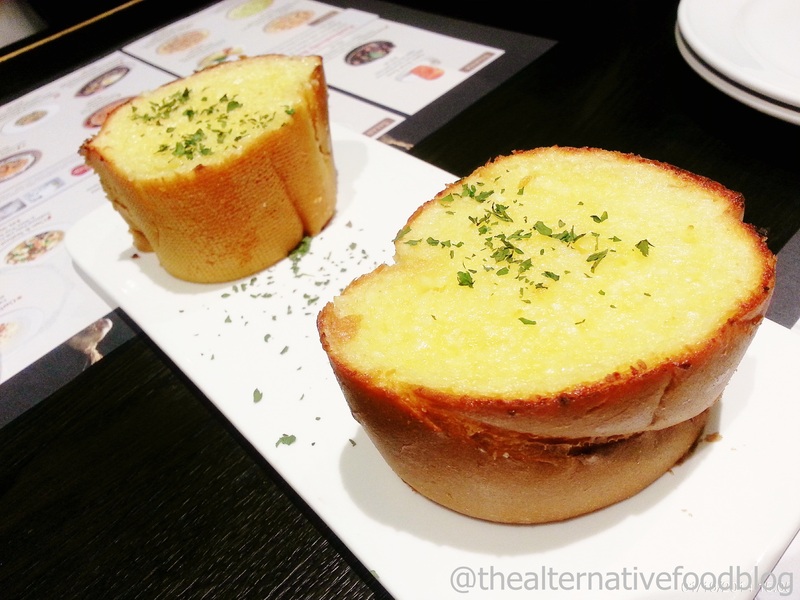 The large servings at Mad for Garlic meant that we couldn’t order more of their dishes to try, and it was certainly a pity that we couldn’t order their signature Garlic dessert to try. However, based on the three dishes we ordered, we were impressed by the food served at Mad for Garlic, especially with the way the taste of garlic has been incorporated into the dishes. 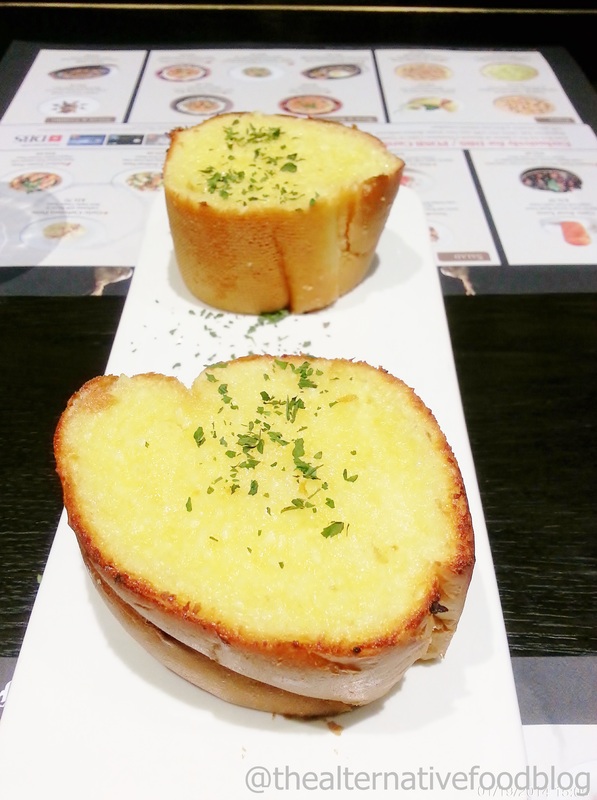 The prices may be a little steep compared to other casual dining establishments within Suntec City but the innovative take on garlic as a main ingredient justifies the prices of the dishes. My friend and I will definitely visit Mad for Garlic again, and this time, we will order a full sized Garlic Baguette. Our Ratings: ♡ ♡ ♡ ♡ / ♡ ♡ ♡ ♡ ♡ (4 out of 5 hearts). how can one be vegetarian but eat clams and shrimps? vegetarianism includes all animal flesh, to which these naturally count as well… please get your definitions right, particularly when you claim to explain them. Hi Martin, firstly, thank you for reading our review. 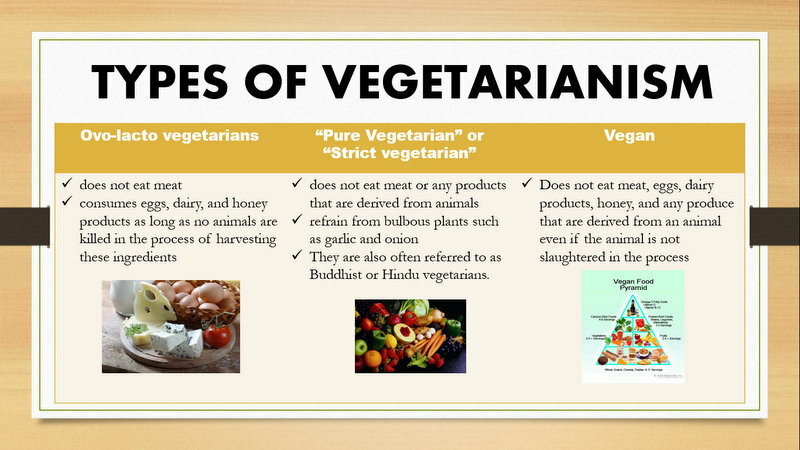 Yes, we are very aware of the different types of vegetarianism and the dietary requirements of each and every group of them. 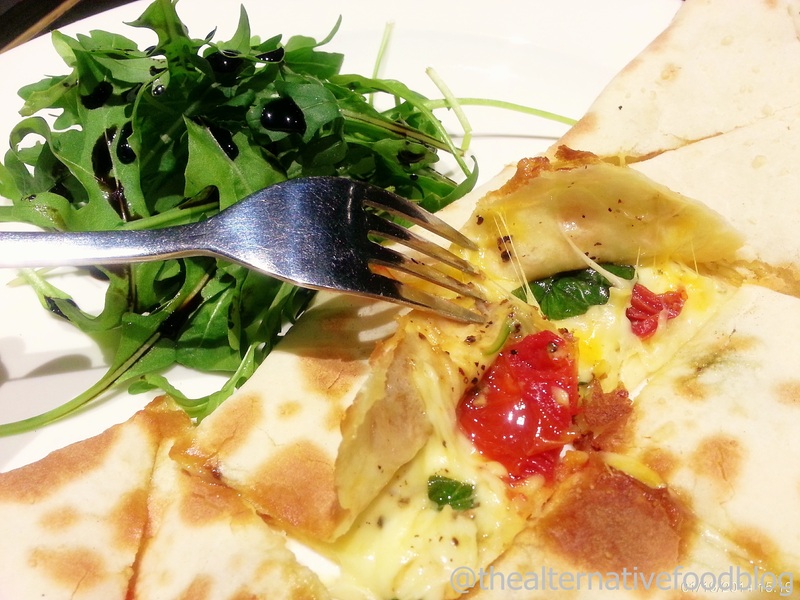 If you read our review again, you will notice that I (Kit) am vegetarian and I was the one who ordered the calzone at that point when I was still taking in dairy products. The seafood pasta was tasted by a friend who is not vegetarian. Perhaps that was not made clear in the review. Also, if you read our “about us” section you will see that our blog is not a pure vegetarian blog, but rather, a source for ‘alternative’ options when in a restaurant that is not purely vegetarian. Nonetheless, thanks for your comment – it has helped us become more aware of the common misunderstandings that may arise from our reviews.